Altenew has a beautiful line of alochol ink markers, and there’s a new Set D in town! Set D carries shades of purple, turqouise, and brown, and as you can see in my card showcased today, the colors are vibrant and blend beautifully together. If you’re familiar with my work, then you know I love to color with copic markers, and I can say that coloring with these are very similar. So if you like the coordinate your marker colors with the Altenew line of colors, this is right up your alley! For my card, I used the images from the Amazing You stamp set. 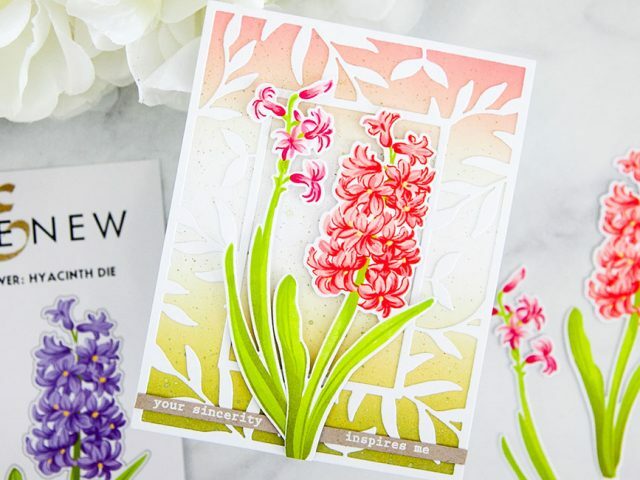 These bold, whimsical flowers are easy to color and perfect for the card I had in mind. I stamped the images in a black hybrid ink and colored them with markers from the Artist Markers Set D. I also added some highlights with a white gel pen. Then, the images were die cut out with the coordinating dies. I did some spotlight ink blending to enhance the floral frame I was creating. I stamped the bold ‘Hello Beautiful!’ sentiment in black right in the center. Then, I added all my flowers to the card using foam tape. 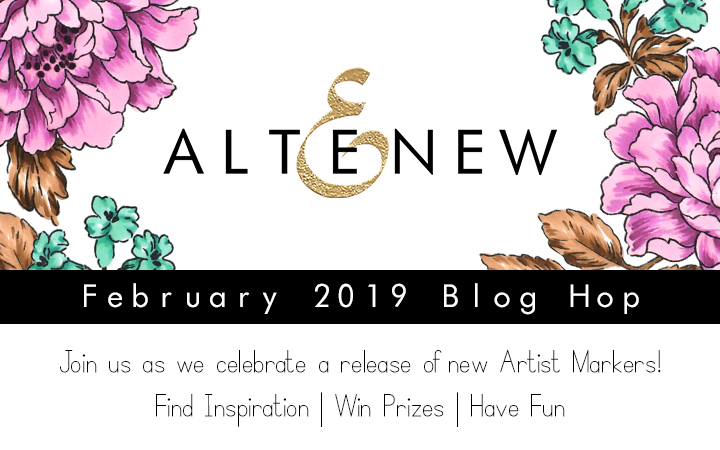 This post is part of the Altenew February 2019 Artist Markers Set D Release Blog Hop! If you’ve been hopping along with us, you would have arrived here from Vicky’s blog and your next stop is with Norine! You can find the full blog hop list or start at the beginning from the Altenew Card Blog. To celebrate this release, Altenew is giving away a $50 gift certificate to 6 lucky winners! Please leave a comment on the Altenew Card Blog and/or Altenew Scrapbook Blog by 2/13/2019 for a chance to win. 6 winners will be announced on the Altenew blogs on 2/16/2019. A winner will also be drawn for a $30 gift certificate to ONE lucky winner from this blog post! Please leave a comment on this post by 2/12/2019 for a chance to win. Winner will be posted in the Giveaways Page on 2/12/2019. UPDATE: Congratulations Ruth Gauss! Please e-mail winner@altenew.com by 2/28/2019 with the subject line “Altenew 2/7/2019 Release Blog Hop Winner from Keeway’s Blog” to claim your prize! I love your card and the colors look amazing. Gorgeous card. I appreciate you letting us know how you like the markers with your copics. I was wondering about this. Love your coloring on those roses! This card is so pretty! Love the new marker set from Altenew. Love your card using the new colors. The small roses are perfect with the pinks, purples, turquioses, and browns! Love this card — clean and elegant! I love this new marker set…the colors are great! And your card was just beautiful….thank you so much for sharing your pretty card today….off to hop along…hugs! The colors in this set are awesome. Thanks for sharing your card. I love those big bold lines of the flowers and leaves! It looks so bright and carries a big punch! LOVE it! Really pretty. You make it look easy. I love the colors and placement of the flowers. Very artistic design. 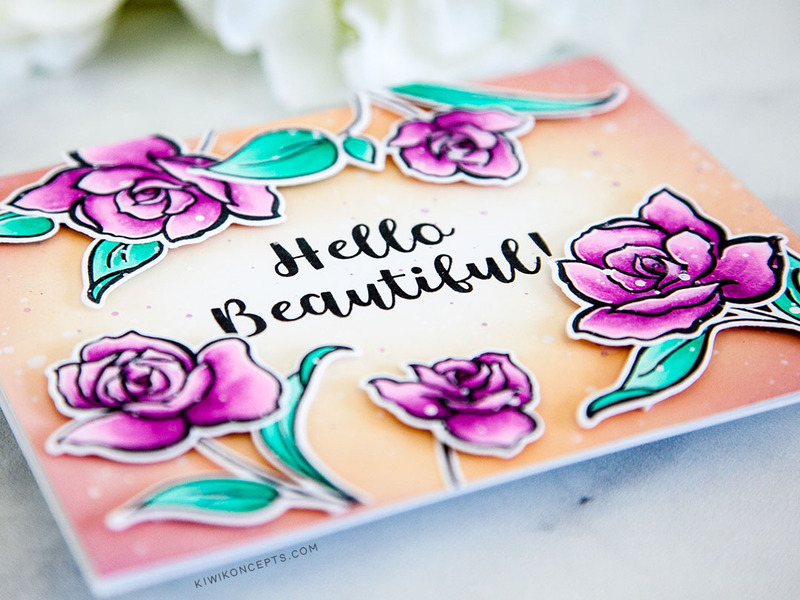 Love these colors together and what a beautiful card you’ve created! Your wonderful frame is perfectly lovely with this sentiment!!! Thank so much for sharing and inspiring!!! Hi Ruth! Congratulations, you’ve been randomly selected as the winner for the $30 gift certificate to Altenew! Please e-mail winner@altenew.com by 2/28/2019 with the subject line “Altenew 2/7/2019 Release Blog Hop Winner from Keeway’s Blog” to claim your prize! Your coloring is gorgeous! Love these colors. Such a cheery card! The new marker colours are lovely. Beautiful card – such lovely, bright, fresh colours. I love how you used the colour to frame the sentiment. I like your coloring and the depth you added to the card. Your card is very nice! I especially like the white gel pen highlights. I will have to try that myself. I love the colors you chose too! What a lovely card. Love the colors and layout. Te background you created for the gorgeous flowers is just perfect!! Beautiful card! I love the blending and dimension. Thanks for sharing! Love the new artist marker colors!! Beautiful card I love the soft touch look. Beautiful card and the coloring is perfect. Thanks for sharing your talent with us!! 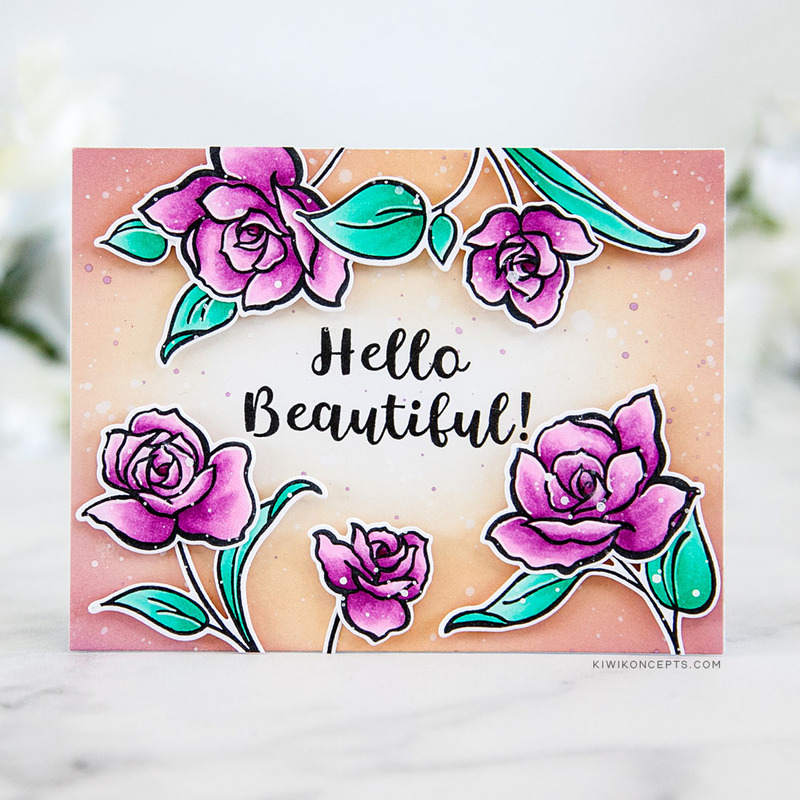 Your hello beautiful card is definitely beautiful! Love the colors. Thanks for sharing! Love the simplicity of your design, and the coloring is very pleasing to the eye. Your coloring is gorgeous. I love the new colors. TFS! The rich colors really show off these awesome flowers! Great card design! Quite a lovely card !! These new marker colors are fabulous! Your card is very pretty. Love the colors. Thank you for sharing. Really love the new colors. Can’t wait to try them. Your card has a simple and clean look. Love it! What beautiful colors! You used them beautifully as well! The flower framing is so soft and pretty. These colors of markers and ink, are so, so pretty. Your ink blending for the background and with the marker for the flower is an amazing.. Love your designs.. I love everything about this card! The colors are gorgeous and the layout is simple, but very eye catching! Thanks for sharing your awesome talent with us! Gorgeous card. I love the layout and the colors are amazing. I love your card! Really beautiful colors! I love your vivid purple flowers and the splatters! Beautiful! Such gorgeous colors! Love your card Keeway, especially the color combo and the soft backdrop !Thanks for the inspiration! Such a beautiful card! Wonderful colors. 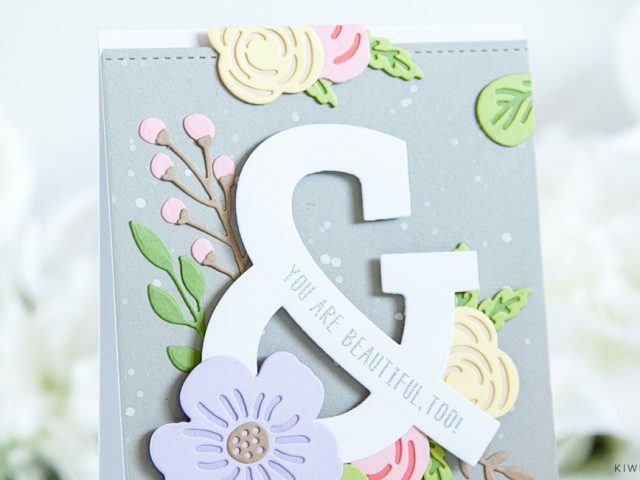 Love the layout of your card and the flowers really pop of the background x. Those marker colors are amazing. Love this card and the colors are beautiful! Very pretty card. 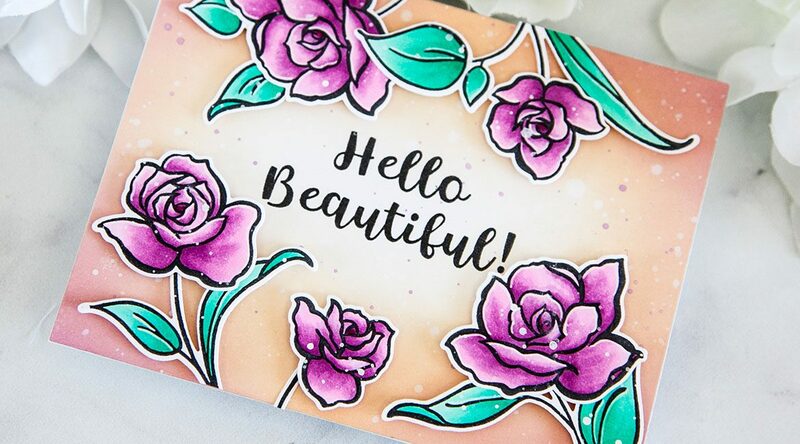 Love these marker colors and the sentiment “spotlight” that highlights the flowers and sentiment. Thanks for sharing. Such a pretty, cheerful card! Love the colors. This is a lovely stamp set & your card is beautiful. Love the vibrant colours of these markers! Beautiful card! This new marker set colors are gorgeous. This card is SO PRETTY!! It makes me happy just looking at it. Love the lift of the flowers. Gorgeous card!!!! Love the colors used!!!!! I love these colors in this newest marker set! The purple-rose colors and the blues in this collection are a match made in heaven. Your card shows them off so well….thank you for your inspiration here! A lovely card. Thanks so much for sharing. What beautiful coloring. I think the smaller flowers work particularly well with these colors. I also really like how you added some pink to the browns in the background; I think it really brings the whole card together. Thanks for sharing with us! Lovely card. I like the spotlight blending on your background. Can’t wait to try it. I love how you incorporated all the colors of the new set with the exception of the browns to make your card. The pink background is sensational and your card turned out gorgeous. Thanks for the inspiration. I love Copics so thank you for mentioning how these are similar. The new set has such brilliant colors and they work so well together, takes the guesswork out of it. Thanks! I like that you raised the flowers from the base card. The added height and the vibrant colors make this a WoW card! This is so special. Just love the colors! Such sophisticated blending of the background colors. Beautiful! A super pretty card, Keeway! Thanks so much for sharing your wonderful inspiration! Amazing colours! Love your card! Absolutely gorgeous! You made it so easy!! 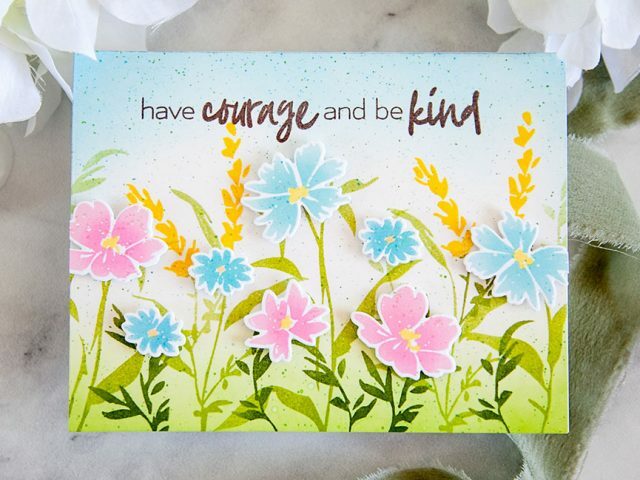 Love how you framed the sentiment with floral and spotlight! What a beautiful card! I really like how you blended your background. It just seemed to highlight your pretty purple flowers! I have this stamp set and love how you used it. It is just so elegant. Thank you!! I love your card. I am glad you chose this stamp set to use these markers on. This set is gorgeous. Your coloring is awesome. I love the background with splattering. Perfect backdrop for the flowers. Love the colours in the new set. And your inspiration card is gorgeous, Keeway. The purple flowers look so beautiful against the lovely background. Beautiful card! I love how you colored/blended around the sentiment. Added depth to the card and a focus on the sentiment. The colors that you used work well together. Thanks for sharing your card. Wow! What a beautiful card!! Your coloring is amazing! Beautiful card! I love the soft color of the background. beautiful way to showcase the colors!! So beautiful and feminine, Keeway, I love it! The colours in this set go so well together! What a fun card! I love how you made the background. Love your card and the new markers! Very pretty card! I love the new colors, especially the purple & pink combo. Thanks for sharing! What a pretty card! I love how you inked the background, leaving the highlight in the middle. It really makes the sentiment pop! I love how you colored the flowers, too. Love your cards! I’m trying to get back to my crafty self that has been wrapped up in work for too long. Your card is gorgeous and you did a beautiful job showcasing this set! beautiful card – love the colors!!! Absolutely love how the purple pops against that background! Gorgeous! Lovely coloring! The purples are so nice and vibrant and look beautiful against the blended background. Gorgeous card! Beautiful coloring and composition. Love the soft blended background. I would have never tried turquoise leaves, but thanks to you, Keeway, I love them and will definitely be doing this now! Thank you! Beautiful card. Love how the flowers pop against the blended background. I am someone who likes to coordinate markers with inks. I think I’m going to have to start buying these markers. I like that the have a fine tip. I like to write and sign my name in matching colors too. Your card is lovely. All of the ink blending is very pretty. What a wonderful card and colouring!! I love the layout! Really impressive!! I must get me some of those markers!! They look like they are easy to use. I think the upside down flowers at the top add such a fun touch to your card! What a beautiful card! The subtle glow in the background is stunning! Thank you for the inspiration! Gorgeous card! Love the flower frame! 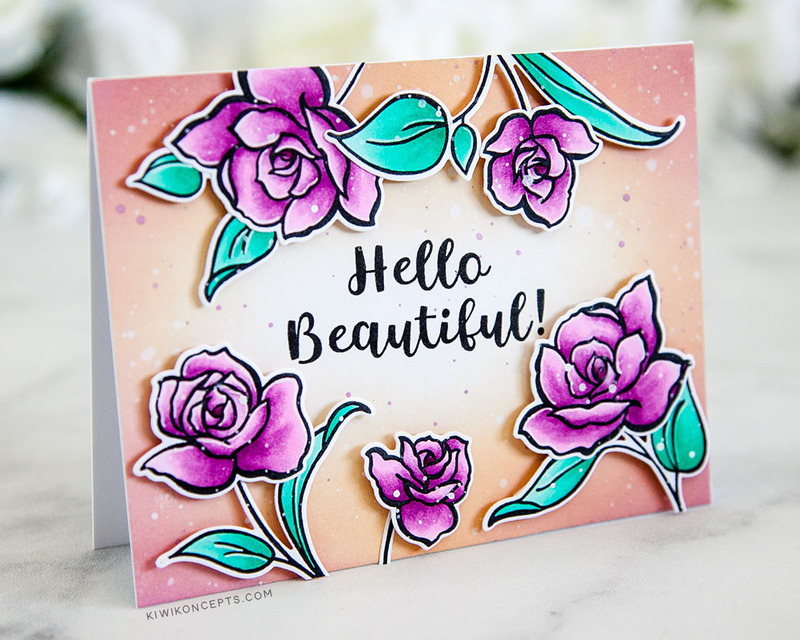 Thank you for sharing your gorgeous card with us, Keeway! I love the orange blending in the background paired with these gorgeous new purple shades from Altenew. Just beautiful! Very pretty card. Your coloring is wonderful! Thanks so much for th inspiration! Love the pretty pink on the flowers! Love these blog hope for inspiration! Your card is amazing! Such a bright and cheerful card! Love the colors in this new marker set! Such a soft and romantic card with these new fabulous colors! Love your card and all the details!